This was a bit of a surprise. I’d had no idea until now that Yes To products were being stocked in Boots stores. The last time I saw them was in Spain lining the shelves of Sephora. Yes To Tomatoes is the arm of the brand devoted to acne, blemishes and oily/combination skin. The range is well priced and Boots stock the cleanser, moisturiser, mask and scrub (there are also wipes and roll-on spot treatments available elsewhere, but haven’t found a reliable stockists yet; any help?). I bagged myself the cleanser and moisturiser, the belt and braces of the Yes To Tomatoes collection. The moisturiser comes in a 50ml, vacuum pump tube and is priced at £11.99. I’ll get what I don’t like out the way nice and quickly; the fragrance. It smells cheap and not of tomatoes as you might expect. For something that boasts 97% natural ingredients, it has a particularly low-rent, artificial fragrance. Besides the fragrance, this is actually an excellent moisturiser. It doesn’t have an SPF/Sun Protection so add one in, especially if you’re currently suffering with any skin concerns or are taking treatment. The texture is creamy and rich which will immediately put you off using it as a moisturiser for combination/oily skin, but as soon as it’s applied, it sinks into the skin and leaves you incredibly soft and mattified. We’re brought up believing we need to dry out skin oils if there’s too much which is wrong, wrong, wrong – it’s about adding the water back in and allowing our skin to stop overcompensating with oil. With tomatoes and watermelon (the feature ingredients), there’s also the hydrating but non-greasy shea butter, sweet almond oil, cocoa butter, olive oil and palm oil (unsure if it’s ethically sourced). There’s also Aloe Vera leaf extract, Vitamin E, Chamomile and Ginki Biloba extract. Definite would recommend this for someone with combination/oily skin leaning more to the oily side than the dry side as it didn’t hydrated my dry cheeks all that well but did soothe my oil-prone T-Zone. The clarifying (exfoliating) cleanser comes in a 90ml squeeze bottle and is priced at £6.99. Now I have to say, I don’t like anything about this product and it doesn’t have a single redeeming feature (the packaging is pretty I suppose). It contains a whopping amount of salt (bog standard table salt) which is known for its antibacterial and exfoliating properties and is why you’re recommended to gargle with salt water when you have a sore throat. But, the problem here is that you feel it on your face afterwards; it doesn’t rinse off (without the use of a different facial wash, which defeats the whole bleedin’ point). That cheap fragrance also stays around this time and is pretty unbearable. Despite boasting 98% natural ingredients, it feels, smells and behaves like a cheap artificial face wash that you could pick up from any pound store or bargain bin. This is such a shame considering how good the moisturiser is as well as the rave reviews I read of the rest of the Yes To product library. Oh well. Good moisturiser, crap cleanser. If you’re looking for something gentle to soothe blemishes whilst protecting and hydrating the skin rather than slathering it in greasy product, then the Yes To Tomatoes Combination Skin Daily Balancing Moisturiser is definitely one to look at. 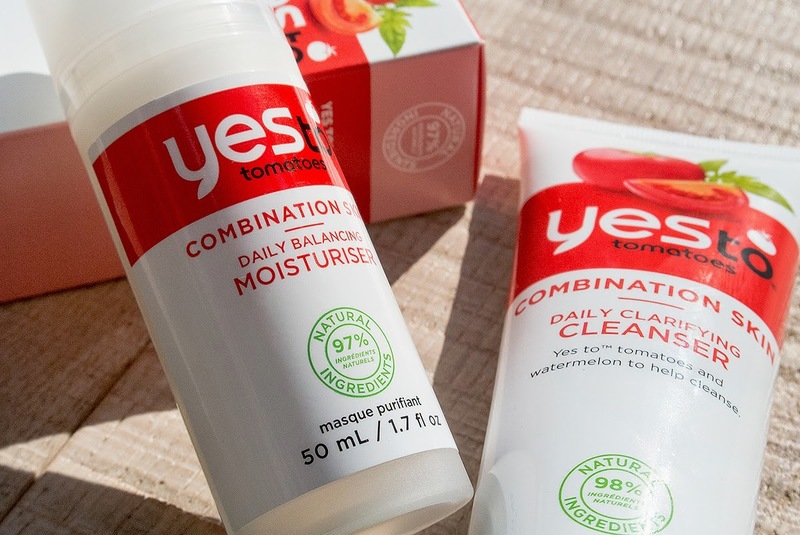 You can check out the whole Yes To Tomatoes range here at Boots and here is the link to the rest of the Yes To product library which features products for normal skin, uneven skin tone, wrinkles and sensitive skin. This article first appeared on MANFACE written by Thom Watson. It was published on Friday 11th July 2014 and was last updated on Monday 3rd April 2017 at 2:01pm. It's categorised under Acne, spots & blemishes, Cleanse, High Street, Moisturise, Oily Skin, Yes To Carrots where you'll find more related content.